New York Police Lieutenant Eve Dallas and her partner Peabody enter the hallowed halls of the Wilfred B. Icove Center for Reconstructive and Cosmetic Surgery on a case. A hugely popular vid star has been beaten to a bloody pulp - and has killed her attacker in the process. After a post-op interview, Dallas and Peabody confirm for themselves that it's a clear-cut case of self-defense, but before they can leave the building, another case falls into their hands. Dr. Wilfred B. Icove himself has been found dead in his office - murdered in a chillingly efficient manner: one swift stab to the heart. Struck by the immaculate condition of the crime scene, Dallas suspects a professional killing. Security discs show a stunningly beautiful woman calmly entering and leaving the building: the good doctor's final appointment. Known as "Dr. Perfect," the saintly Icove devoted his life to his family and his work. His record is clean. Too clean for Dallas. She knows he was hiding something, and suspects that his son, his successor, knows what it is. Then - like father, like son - the young Dr. Icove is killed . . . with the same deadly precision. But who is the mystery woman, and what was her relationship with the good doctors? With her husband, Roarke, working behind the scenes, Dallas follows her darkest instincts into the Icoves' pasts. And what she discovers are men driven to create perfection - playing fast and loose with the laws of nature, the limits of science, and the morals of humanity. I just love everyone of these books and this one is no exception. I read all J. D. Robb's books as soon as they come out in paperback and then re-"read" them on audio. Great stories, very entertaining. Loved the book and how the author continues to develop the characters in this series. Great book, one of my favorite so far. This was my first exposure to J.D. Robb/Nora Roberts - and now I am wondering why it has taken me so long to "discover" this author! I love sci-fi and mysteries; Origin in Death combines both my favourite genres with a strong female lead character and dry humour. What's not to like? I plan to enjoy the whole series now. I loved the book. Lots of twist and turns to keep you guessing. The idea was a mind binder and made for exciting listening. 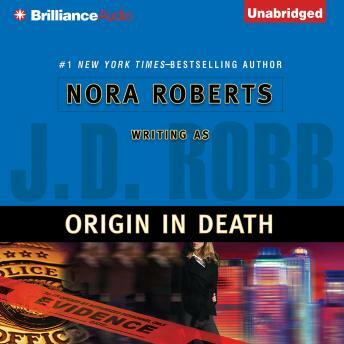 This is the first book I've braved by Nora Roberts (JD Robb). The story was incredibly well done, immersive and the characters were well developed. The story was detailed and thought out from beginning to end. I'll be sure to check out the other titles by this author. With each succesive novel the character of Eve Dallas becomes more loathsome. I feel that after 8+ books, we all know about Eve's 'tragic past'. Please stop bludgeoning us over the head with the tragedies of her past and using this as her excuse for reprehensible behaviour to her colleagues, acquitances and sometimes even innocent bystanders. What she needs is a year or two off and some intensive therapy. After reading so many of the "In Death" series, I liked listening to this one. Some of these characters are like old friends. I would like to have such strong friendships. I look forward to finding out what is next. A very clever and thought provoking novel in the Eve Dallas series. Narrator does a great job in reading and Detective Peabody again steals the show. Excellent!! It keeps you on the edge of your seat. The characters are believable, and the plot moves along well. One of the best audiobooks I have ever heard! !